For the burnt-orangest of Longhorn fans, the story of the first Bevo mascot is as familiar as the scent of fresh breakfast tacos on game day morning, and the sight of an orange tower that night. 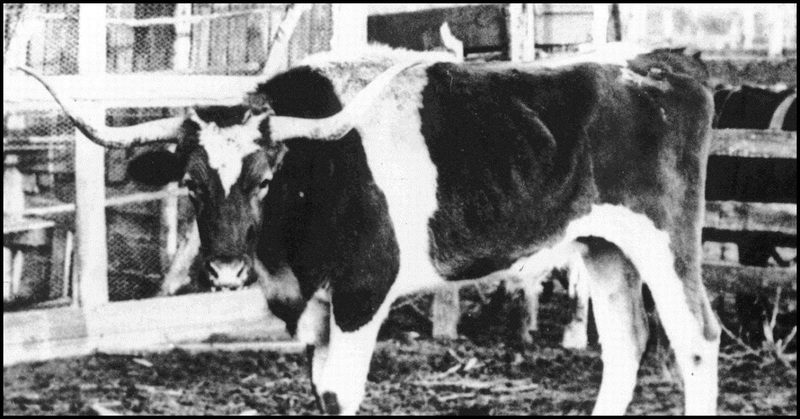 In 1916, UT alumnus Stephen Pinckney, with some help from fellow alumni, purchased a West Texas longhorn steer and had him shipped to Austin on a train in time for the Thanksgiving Day football bout between the University and the A&M College of Texas. The steer, chosen because of his orange-shaded hide, was presented to the students at halftime (photo above) and then taken to a South Austin stockyard for care and safekeeping. Texas went on to win the game 21 – 7. An on-campus debate ensued over what to do with the steer. Some wanted to brand Bevo with a “T” on one side and the winning “21 – 7” score on the reverse. Others thought that was animal cruelty and advocated for putting the steer out to pasture. 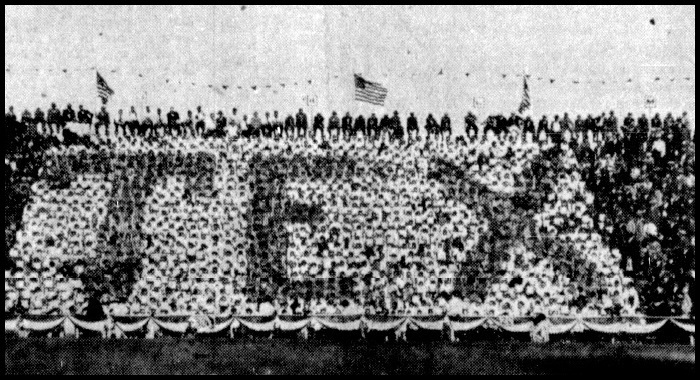 The discussion was settled months later on February 12, 1917, when a group of Texas Aggies broke in to the stockyard and branded Bevo with the numbers “13 – 0,” the score of the 1915 football game A&M had won the previous year. With rumors swirling that the Aggies planned to return and kidnap the steer outright, Bevo was hurriedly moved to the Tom Iglehart Ranch west of Austin. Six weeks later, in early April, the United States entered the First World War, and thoughts of mascots quickly took a back seat to the war effort until the Armistice was signed on November 11, 1918. When peacetime again returned to the campus, University officials considered the Bevo situation, and declared the steer was simply too wild to attend football games. Besides, many UT students had lost interest in Bevo; he had, after all, only made a single public appearance two years previously, and those who remembered him thought the mascot had been “ruined” by the 13 – 0 brand still on his side. Besides, the students already had a huggable, pettable live mascot in the form of Pig Bellmont. 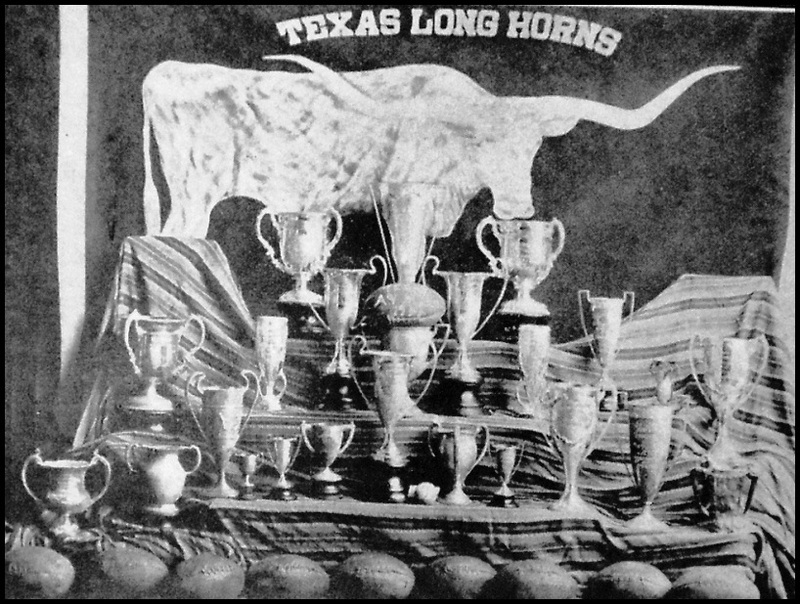 As it was costing 60 cents a day to keep an unsuitable Bevo on a ranch, the athletics department decided to make the animal the barbecued main course of the January 1920 football banquet for the 1919 Longhorn team. Both Pickney and Iglehart attended the event, along with a delegation from A&M. “The branding iron was buried and the resumption of athletic relations, after an unhappy period . . . duly celebrated,” announced the Longhorn magazine, a monthly published by UT students. “The half of the hide bearing the mystic figures 13 to 0 was presented to A and M with appropriate ceremonies.” Bevo’s head and horns were mounted by a taxidermist in New Braunfels, and it and the other half of the hide were to be kept on the Forty Acres. So, whatever happened to Bevo’s head? Above: The Victorian-Gothic Old Main Building. 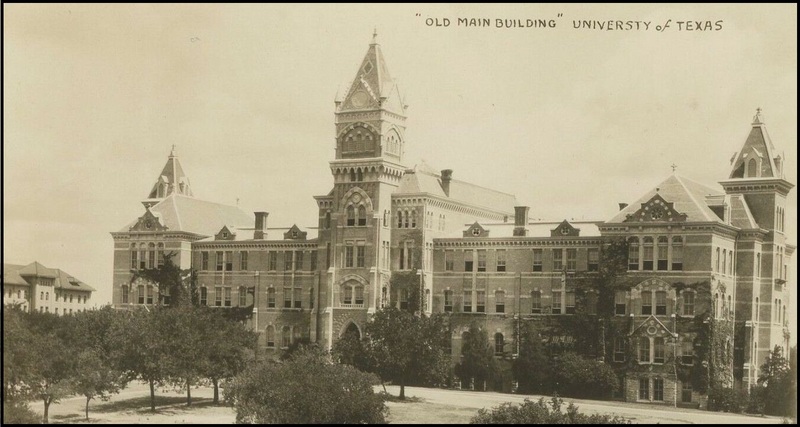 A visitor to the University of Texas campus in the 1920s would have discovered a jumble of buildings whose disparate styles sent a mixed message for what was supposed to be a “university of the first class.” At the top of the hill stood the Victorian Gothic old Main Building, stately and elegant, its pointed windows and rooftops softened by the deep-green ivy that draped its walls. Nearby, the library and education building (today’s Battle and Sutton Halls), along with the Biological Laboratories and Garrison Hall, boasted Mediterranean facades with red-tile roofs, a style the Board of Regents thought was both appropriate for the bright Texas sun and honored the Spanish heritage of the state. 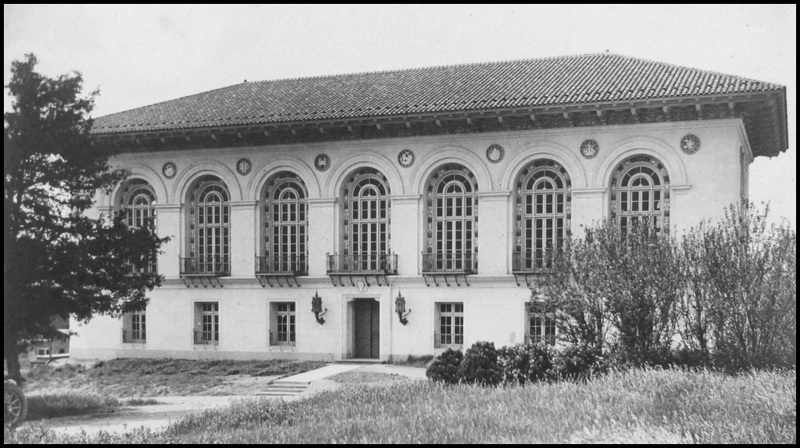 Decorations on these buildings ranged from ancient classical symbols to contemporary images, and brought an air of sophistication to the Forty Acres. And then there were the shacks. Starting in 1911, with the University expanding faster than its funding allowed, and without monies for conventional classroom buildings, UT President Sidney Mezes had cheap, temporary facilities constructed. They were made from pinewood, without proper foundations, and outfitted with potbelly stoves for heat. Mezes ordered the “shacks” – as they were informally known – to be left unpainted in the hope that their appearance would be so embarrassing, the state would quickly replace the shacks with adequate buildings. It didn’t work. Entire academic departments were housed in the shacks, which were summarily labeled with letters of the alphabet. Professor Spurgeon Bell, the founder and first dean of UT’s business school, taught his initial accounting classes in “G” Hall (photo at left). 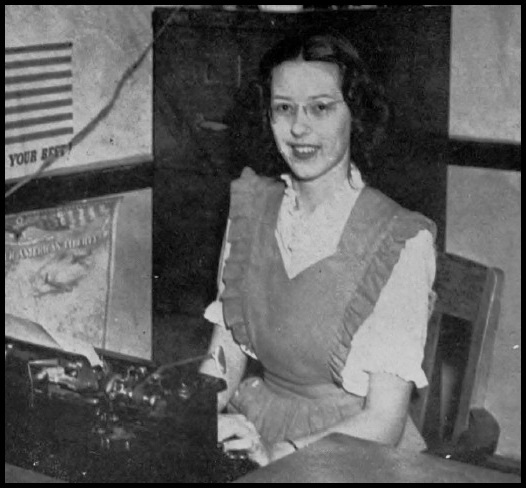 On chilly winter days, in order to warm the classrooms before students arrived, Bell’s daily routine began by stoking the coals in the stove left by the custodian the night before, and then hauling in firewood from a stack behind the building. The visible contrast of unpainted shacks standing next to the library or Old Main was striking, and was certainly not the impression UT administrators hoped to convey for an aspiring first class university. 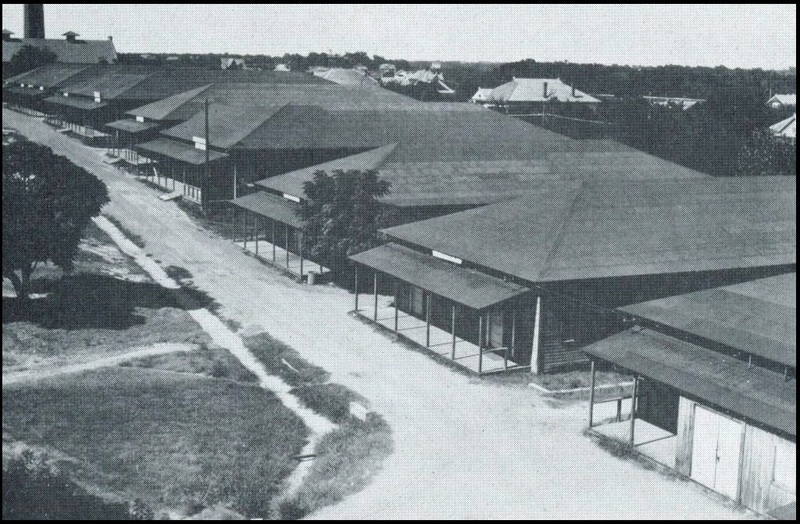 In 1918, during the First World War, a row of additional shacks was built along the eastern edge of the Forty Acres next to Speedway Street. They were first used as barracks for the Student Army Training Corps as part of the University’s war effort (see “To Serve the Nation”), but were re-purposed as classrooms and offices after the war. The shack at the south end of the row, perched on the corner of 21st and Speedway (where the business school is headquartered today), was “Z” Hall, home to UT’s Department of Men’s Athletics. Above: A row of pinewood shacks on the east side of campus, where Waggener Hall and the business school are today. Speedway Street runs behind the buildings. Closest, at bottom right, is part of “Z” Hall, used by the athletics department. The front door was on the west side, and upon entering, a visitor first encountered a long corridor filled with displays of banners and trophies, as well as footballs, baseballs, basketballs, and track relay batons from important contests. Here, too, were rows of team photos and framed portraits of those who had earned varsity letters (“T” Men), with a special section for athletes who’d lettered in three or more sports. Above left: One of the trophy displays in “Z” Hall. Past the coaches’ offices, whose walls were crowded with still more team photos, action shots, and Texas pennants, a suite of rooms in the rear of the building was reserved for Athletic Director Theo Bellmont. Along with space for an executive assistant and Bellmont’s own office, an adjoining conference room was used for Athletic Council meetings. Here, mounted on one of the conference room walls, was the head and hide of the first Bevo. 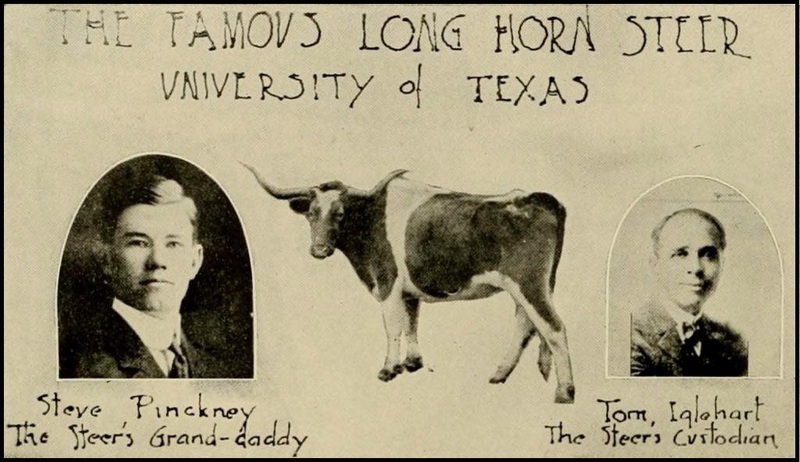 By the mid-1920s, Bevo was largely forgotten by the University community. 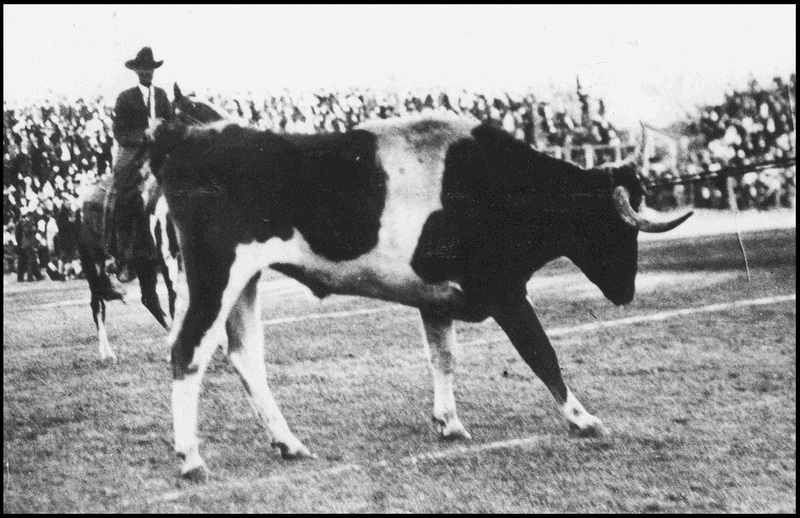 Few, if any, of the students were on campus when the steer made his 1916 debut or knew of his integral contribution to the football banquet a few years later. Bevo, though, wasn’t simply gathering dust. In “Z” Hall, a place overflowing with awards and mementos, the steer’s four-foot two-inch horns were put to good use. From each horn, a prized football was hung. One was the ball used at the 1923 Texas vs. A&M game, still splattered with mud from Kyle Field in College Station, when the Longhorns won 6 – 0 to cap an 8 – 0 – 1 season. The other football was saved from the A&M game of the following year, on Thanksgiving Day 1924, when the new Texas Memorial Stadium was formally dedicated. The Longhorns earned a 7 – 0 victory over the rival Aggies. In the fall of 1928, Lynwood Boyett (photo at left) was full of new ideas. Elected head yell leader in the campus-wide elections, Boyett worked hard to improve the measure of Longhorn spirit around the Forty Acres and at football games. He tapped in to the energy of the freshmen class and created a special “Rooter Section” in the stadium just for the greenhorns. So that the section would be unmistakable, Boyett asked the frosh to wear uniforms of long-sleeve orange shirts and bright white suspenders, with the traditional freshman class green caps. The University Co-op agreed to sell the rooter uniform at cost, and by the first game of the season, hundreds of first-year students had registered for the rooter section and purchased their uniforms. Along with leading the rest of the stadium in the Rattle-de-Thrat and Lollapaloose yells, Boyett had the freshmen perform “card stunts,” better-known today as a flash card section. Boyett also hoped to add some pizazz to the football rallies, which were then held at the campus Open Air Theater, an amphitheater just north of the old Law School. (Today, it’s the hill just north of the Graduate School of Business building that leads up to Garrison Hall.) He bolstered the line-up with more speakers and performers, and worked to increase attendance not only of the students, but of local alumni and Austin citizens. Before he was elected head yell leader, Boyett had served two years as an assistant yell leader. He’d dropped by “Z” Hall to see the Athletic Director Bellmont many times, attended meetings in the Athletic Council conference room, and learned the history of the steer hanging on the wall. 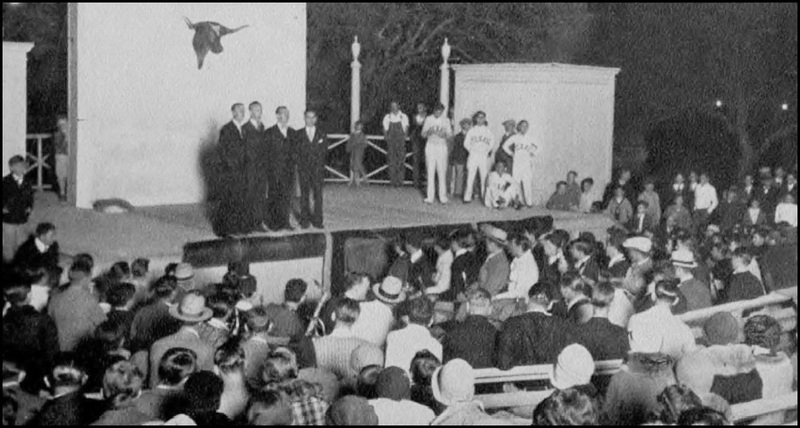 As head yell leader, Boyett wanted Bevo to be a part of the football rallies by mounting him on the wall at the back of the stage. Having the original longhorn mascot on the backdrop, where everyone could see him, would certainly add to the atmosphere of the event, and it would elevate Bevo out of obscurity to a more “mainstream” University tradition. Boyett approached Bellmont about the idea. Bellmont was hesitant at first. Moving the steer head could damage it, or, away from the protective confines of Bellmont’s office, something worse might happen. He eventually agreed to allow it for the rally set for Friday, October 19th at 7:15 p.m., the night before Texas opened Southwest Conference play against the Arkansas Razorbacks. Above right: Yell leaders address the crowd at the football rally before the UT vs. Arkansas game. The rally was a great, standing-room-only success. 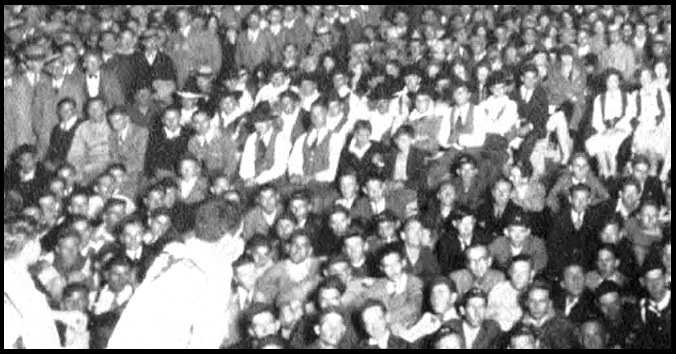 A Metro-Goldwyn-Mayer (MGM) news reel crew recorded it and Saturday’s game, and highlights of both were later shown in movie houses nationwide. (Unfortunately, the film hasn’t survived.) Texas defeated Arkansas 20 – 7. Two weeks later, Boyett again received permission to borrow Bevo for the “Smash S.M.U.” rally slated for Friday, November 2nd. It was the largest rally of the fall and featured baseball coach Billy Disch, who made his first speaking appearance of the season. “If you will just do your share tomorrow,” Disch told the cheering students, “the team will go forward to victory. The very atmosphere seems to spell it. 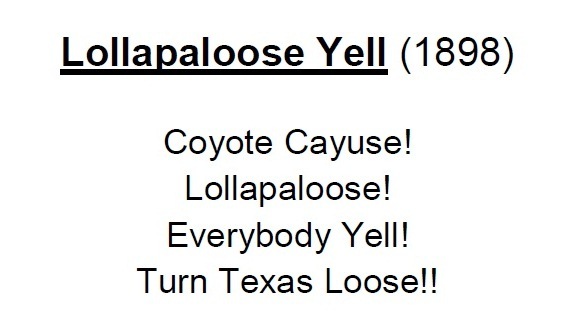 You are going to help put the boys over the top!” A quartette from the UT Glee Club performed, Longhorn team captain Rufus King gave a pep talk, and the assembly practiced their yells for Saturday’s game against Southern Methodist. All the while, Bevo looked out to the crowd from his mount on the stage backdrop. Above: The Glee Club quartet performs at the “Smash SMU” football rally, with Bevo mounted on the stage backdrop. When the rally was finished and the lights turned off, Boyett and a student helper – identified only as “Freshman Harkrider” – were to carry Bevo to the law school library in the Law Building, just a few steps behind the stage. The athletics offices were already closed and locked, and the library staff volunteered to keep the steer safe until the next morning, when he could be returned to his usual haunt in the conference room. The Daily Texan, though, needed a quick interview to complete a story on the rally before the newspaper’s deadline. 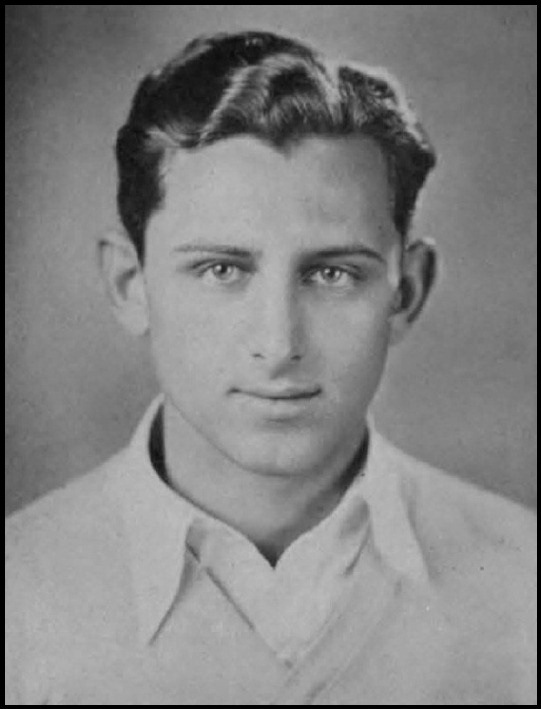 Instead, Boyett and Harkrider, with Bevo in tow, headed north to the Texan’s offices, finished the interview in a few minutes, and then left for the Law Building shortly after 9 p.m..
Half way to their destination, Boyett and Harkrider were ambushed in the dark by five men. Bevo was wrestled away. The abductors made their escape in a car that Boyett could tell “had a rumble seat” and went the wrong way on the single-lane campus drive. It exited the Forty Acres near the present day Littlefield Fountain and sped off into the night. Boyett and Harkrider ran back to the Texan to report what had just happened, phoned the Austin police, and then went downtown to inquire at the hotels. No one had seen Bevo. It was a clean getaway. To add to the misery, the Longhorns lost to S.M.U. 2 – 6 on Saturday. For the next two weeks, rumors swirled about the location of Bevo. A witness in Waco claimed to have seen an overcrowded car heading north to Dallas the Sunday after the game. Someone in the rumble seat had an orange Texas blanket covering “something suspicious.” An S.M.U. fraternity was allegedly openly boasting it had the kidnapped Bevo. The abductors were rumored to have been five freshmen – possibly fraternity pledges – who were ordered to drive to Austin and steal the steer. The S.M.U. student newspaper, The Daily Campus, printed a pair of articles: one claimed that engineering students were behind the Bevo heist, the second reported the steer had been seen at S.M.U.’s football rally before its game against A&M. All the while, Dallas area alumni were quietly making inquiries and reported what they learned back to the athletics department. On Friday, November 16th, as the football team and yell leaders arrived in Fort Worth for Saturday’s game against Texas Christian University, word reached Boyett that Bevo was being held in a rooming house near the S.M.U. campus. A quick excursion to Dallas proved to be fruitful, as a rescue party composed of the yell leaders and a few local alumni safely recovered the steer without incident. Bevo was triumphantly shown at a pre-game gathering of Longhorn fans on Saturday, and Texas won out over T.C.U. 6 – 0. After his brief “tour” of North Texas, Bevo at last returned to the serenity of the Athletic Council conference room, permanently retired from football rallies. Above: An almost-completed Gregory Gymnasium in 1930. At 11 a.m. on Friday, April 11, 1930, the Longhorn Band met in front of the old Main Building, then proceeded to march down what today is the South Mall, turned left on to 21st Street, and continued to the corner of Speedway. Several thousand students, faculty, and staff followed along, as UT President Harry Benedict had declared classes cancelled for the rest of the day. The occasion was the official dedication and open house of Gregory Gymnasium. 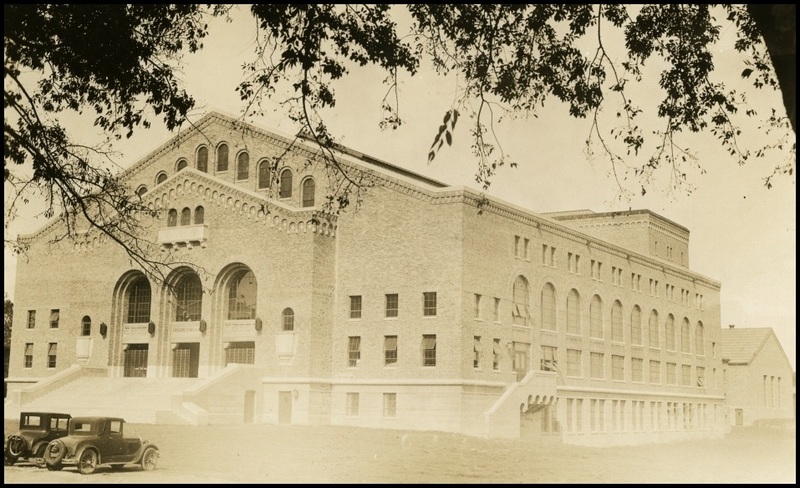 The gym was the first of phase of the “Union Project,” an ambitious and unprecedented $600,000 fundraising campaign by the Texas Exes to build Gregory and Anna Hiss Gyms, the Texas Union, and Hogg Auditorium. The project was launched in 1928, but the stock market crash the following year and ensuing Great Depression made the going difficult. Some alumni were only able to contribute a single dollar, as that was all they could afford, while others wrote that they’d skipped meals in order to save enough for pledge payments. 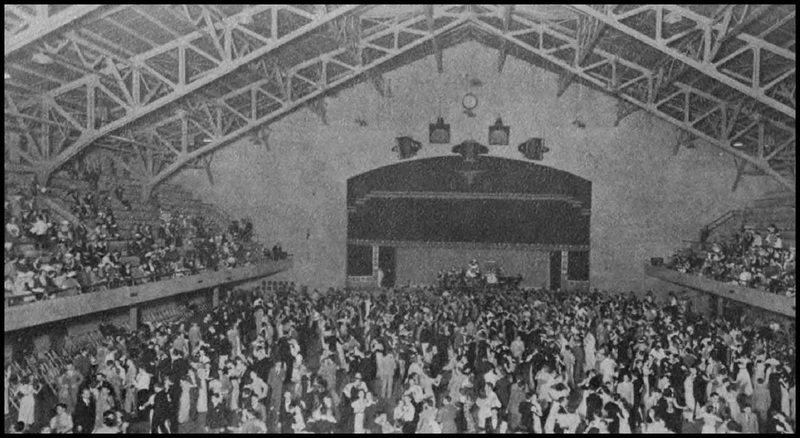 Gregory Gym was intended to be both an athletic facility and auditorium, and it initially served UT and the citizens of Austin. In its first decade, jazz greats including Benny Goodman and Glenn Miller performed for all-University dances (photo at left), but so, too, did the Austin symphony and opera. The gym was home to the men’s swimming and diving, and basketball teams, and was headquarters for UT’s intercollegiate athletics, recreational sports, and physical education. The coaches and staff in “Z” Hall were happy to vacate the old shack and move across the street. In the main foyer, glass cases were filled with trophies and photos, and Bevo, removed from his confines in the conference room, was reverently hung above the center doorway, where everyone could look up and see him as they passed through the foyer and entered the gym. There he remained for over a decade. “Again calamity and shame have befallen on Bevo I,” announced the Texan on Wednesday, November 24, 1943, just a day before the Thanksgiving football game with Texas A&M. The University community discovered at the stadium and near the Tower “there was evidence that someone had been quite busy with generous amounts of whitewash.” The anonymous painter had left messages on how badly Texas would lose to the Aggies in College Station on Thursday. Worse, though, was the outright destruction found in Gregory Gym. The horns of Bevo’s mounted head had been physically torn off, leaving only ragged edges. Whitewash can be cleaned; this was permanent damage to something irreplaceable. Texas won the game 27 – 13, and what was left of Bevo’s head was removed and rumored to have been placed in the storage area underneath the front stairs of Gregory Gym. Both the head, and the hide, have long since disappeared.